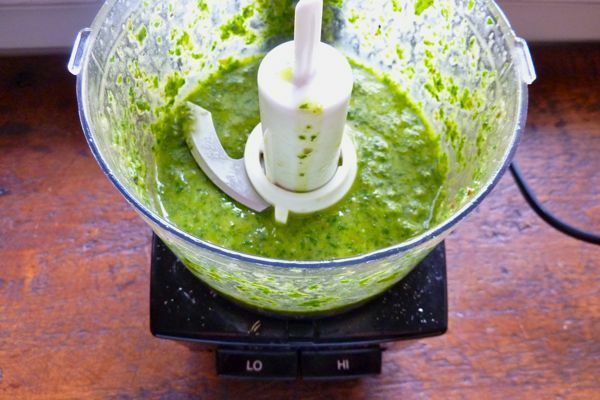 Process all ingredients except oil in a mini food processor or blender. Then, slowly add olive oil as you whirl and the sauce emulsifies. Remove to a small dish and spoon over fish. Or chicken. Or meat. Or veggies. Thanks for the great recipe. Tons of parsley in the garden. Might try over some pasta and grilled ship for the kids tonight. They always love a new addition. In some parts of the world this is called, chimichurri. But you knew that. LOVE this sauce. Freezes well, too. Thanks. Now I know what to do with the parsley that is going nuts in my garden. Thanks! I love a good bastardized sauce. And anchovy. And tossing of capers. What I’m trying to say is that this is my kind of wonderful. It will soon be had on fish. Or chicken. Or meat. Or veggies. Hi Andy – You guys had a green sauce with the grilled haloumi post too. Which do you prefer? The addition of anchovy to this one is tempting. I think I might like it better, but haven’t tried it yet.